Rephresh RepHresh Wash™ Sampling Program - Welcome to the RepHresh™ Daily Intimate Wash Sampling Program! Due to inactivity, your online session with Rephresh will expire in 60 seconds. Welcome to the RepHresh™ Daily Intimate Wash Sampling Program! You're here because you're an influencer among Church & Dwight Co., Inc. customers. People trust your opinion when they're making purchase decisions and value your honesty. RepHresh™ Daily Intimate Wash Sampling Program is a program recently launched at Church & Dwight Co., Inc. to get some of our newest products in your hands in exchange for your honest reviews. As a program member, you will be periodically invited to choose products to receive, completely at no cost to you. Church & Dwight Co., Inc. does not influence the opinions of RepHresh™ Daily Intimate Wash Sampling Program members, nor do we modify or edit their reviews. A review collected through this program will be labeled as such on rephresh.com. We value customer feedback about products, and so do other customers. The RepHresh™ Daily Intimate Wash Sampling Program Program allows our most trusted reviewers to provide honest and unbiased feedback on new or currently sold products on rephresh.com. Membership is granted to RepHresh™ Daily Intimate Wash Sampling Program on an invite-only basis. We are seeking customers who enjoy sharing their opinions and sentiments about products they use. Thus, RepHresh™ Daily Intimate Wash Sampling Program members are selected based on several criteria such as the number of reviews written, previous involvement in one of our many trusted communities within Church & Dwight Co., Inc., and membership availability. As a member, do I have to write reviews to stay in the RepHresh™ Daily Intimate Wash Sampling Program? Yes. Authentic reviews are very important in helping shoppers make a buying decision. Through this program we seek to generate more reviews. No. We expect our members to write unbiased, honest and authentic reviews. All RepHresh™ Daily Intimate Wash Sampling Program reviews will be posted on the product's rephresh.com detail page unedited, regardless of whether it is a favorable review or not, provided they follow The Church & Dwight Co., Inc.'s General Review Writing Guidelines. 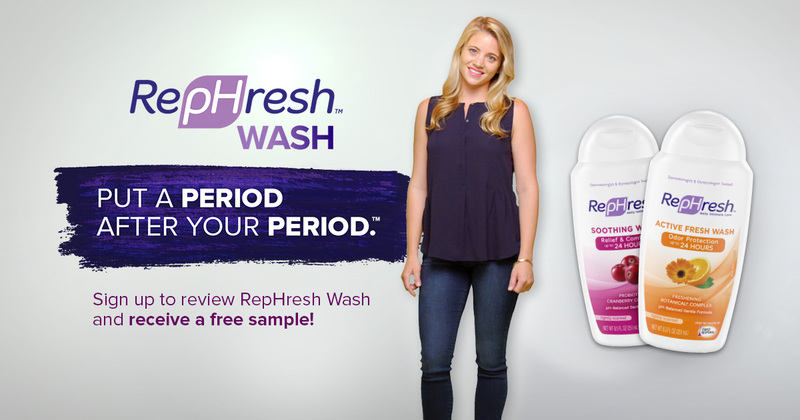 Do RepHresh™ Daily Intimate Wash Sampling Program members get paid for writing reviews? Are reviews collected through the RepHresh™ Daily Intimate Wash Sampling Program program labeled differently? Yes. To ensure authenticity, any reviews gathered through this program is labeled when it is displayed on rephresh.com.